Short Decription Capacity: approx. 1 LBS can be processed at a time.NEW! Bubble Man's Small Tumble Now machine is an attractive and efficient machine for making dry sifted of the highest purity. The Tumble Now is constructed of top quality materials and contains no plastic parts. The Tumble Now is an electric powered, rotating, dry floral essence extractor with dual screen meshes. 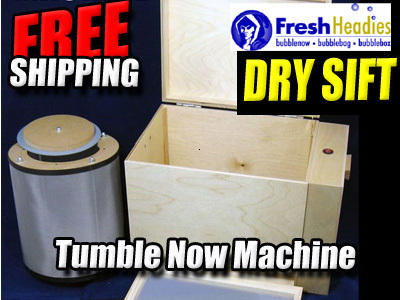 Features include a pull-out dry sift collection drawer and a hinged lid. The motor and wiring are fully enclosed and accessible through a vented access plate. How it Works: The product is placed inside the mesh cylinder and the Tumble Now is switched on. Sifted product passes through the 125 micron stainless steel mesh of the cylinder and collects on the flat screen frame below. The screen frame is made of 70 micron mesh and the product can then be carded to further separate it into two grades. Outside Dimensions (approximate): 18" x 11" x 11.25"